FAVOURITE MY SHOP TO RECEIVE A 10% DISCOUNT CODE! Tired of only getting flyers and bills in the post? Are you a confirmed book addict who is always on the look out for another good read? Do you love a good classic crime novel? 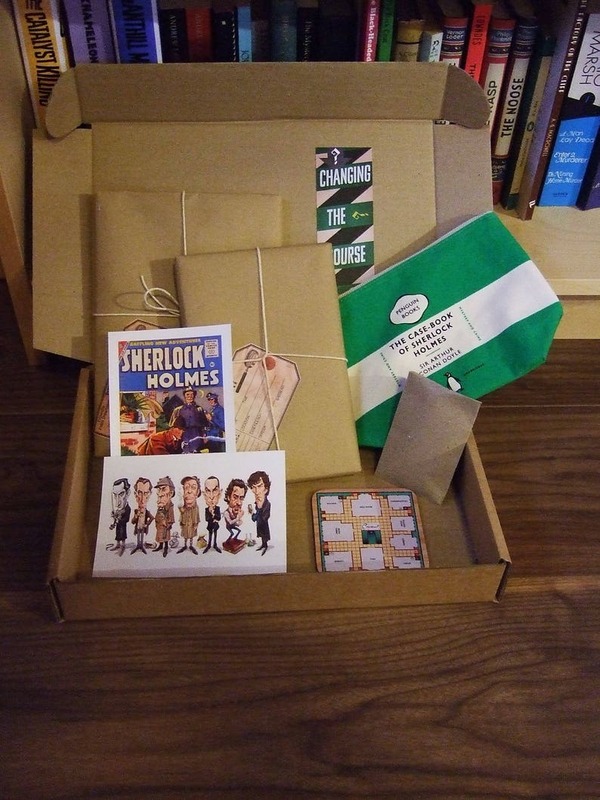 Then look no further than this: a one off or monthly book box subscription! Ideal as a gift or as a much needed treat for yourself. •	A newsletter which highlights upcoming releases, personal favourite reads, puzzles and more! •	Two personally selected surprise vintage mystery novels (although vintage in origin, with some signs of previous use, they will all be in good condition ). •	A sachet of luxury coffee (Great for indulging in whilst reading your latest books). I am currently sending out Douwe Egberts. However hot chocolate and tea alternatives are possible so do drop me a message if this would be preferable. •	Book/Mystery related goodies, such as notebooks, tote bags, coasters and more! (These will change from month to month, so subscribers won’t receive the same gifts twice and examples of these gifts can be seen in the pictures). Are you sending this as a gift to someone new to classic crime? Or are you a long-time fan of the genre and looking for authors more off the beaten track? Thrillers, do you love them or hate? Please send me a message with any questions or requests. If you would like this sent as a gift, direct to recipient, send me your personal message to them. Subscriptions come in 1 month, 3 month, 6 month and 12 month packages. The longer the subscription the less you pay per box. 12 Month subscribers get one of their boxes for free! The prices for the 3 month, 6 months and 12 month packages also include the additional P&P for sending the boxes after the first month. If you are buying 1 month subscriptions for more than one person, such as for 3 people, feel free to select the 3 month package (with the savings) and then message me that they are one month boxes for separate individuals. At the moment the shipping costs below are only for the UK, USA (cheaper options available if prepared to wait 6 weeks to receive it via International Economy) and Australia (3 months, but different quantities can be added on request). However if you are from elsewhere please send me a message and I’ll get back to you with shipping costs for your location. My aim is that all my customers will be happy with the box they receive, but if you have any difficulties or problems please do contact me, to give me the opportunity to rectify anything I can before leaving feedback. I have been a lover of vintage crime fiction for a number of years. There is something irresistible about the quirky, genteel and amateur sleuth, as well as the body in the library of course. This passion has led to me writing my own blog: www.crossexaminingcrime.com, where I frequently review older mystery novels and I also produce articles for magazines such as Mystery Scene and CADs. It is my enthusiasm for this genre that has inspired me to set up this venture and I hope it will appeal to both readers who are new to or diehard fans of a good vintage mystery. Loved the treasure trove of items! Such fun! Shipped very quickly. 2 high quality books, a cookie cutter in the shape of a dead body, a newsletter, a bookmark, 2 themed stamps and an Usborne children's solve it yourself book. Lovely tea too! Having ordered for one friend, I immediately thought of someone else who would like it! Such a clever idea, and I keep thinking of more people who would like it. And Kate at Coffee And Crime is very efficient, and very responsive to questions and special requests. Would definitely order again. I bought this as a present, and it was a huge success: my friend was absolutely thrilled with the box, and even more excited when she found out she was going to get one each month for 3 months. It is a perfect gift: unusual and individual. I made special requests to Coffee and Crime, and Kate was happy to oblige to make the box even more special. Highly recommended.